Bringing home a new baby is a wonderful and exciting time, but it can also be a time that’s taken up with establishing breastfeeding and milk supply, which can make it hard for dad to get a look in when it comes to bonding with his new baby. 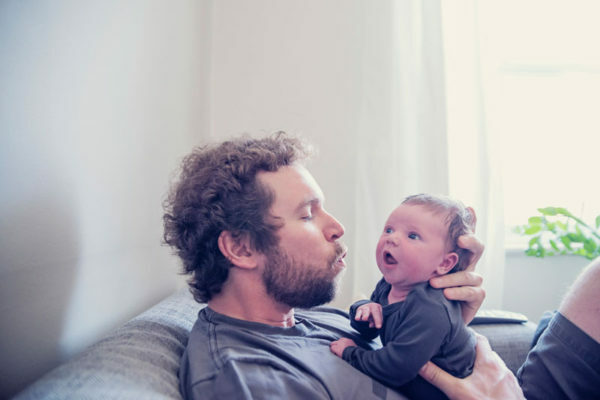 Many new dads can feel pushed aside or not needed during those early weeks, and this can mean they miss out on some important opportunities for bonding with their babies, especially if they head back to work soon after the birth. However, dads still have an important role to play in their new baby’s life, and that involves teaching bub that love, comfort and affection can come without food. In fact, there are plenty of ways for dads to bond and spend meaningful time with their newborns that doesn’t require milk from a breast or a bottle. The benefits of plenty of skin-to-skin time with mum right after birth are well known, but this is something that can be enjoyed with baby for a long time after birth, and not just with mum. “Touch is a big part of building attachment,” says Beth. “Babies feel loved through touch, so it’s just as important for dads to have skin-to-skin time.” A good way to do this is have dad hold baby naked on his chest right after a feed, when baby will cosy up and enjoy the extended cuddle. Similar to the above, baby massage uses lots of gentle touch, which babies love and need from us. Baby massage can also incorporate lots of eye contact and time for chat while dad works his magic on baby’s body, making it a time of real connection. Not all newborns relish in being naked, says Beth, but this won’t necessarily last forever. If your bub isn’t ready for massage right away, simply wait a week or two before trying again. Once babies are more awake and aware of their surroundings, you might find them enjoying the experience more. “Bath time is a great opportunity for dads to bond with baby,” says Beth. If dad can get home from work in time, a nightly bath routine can be a special bonding time for him and bub, that all of you can look forward to at the end of the day – you get to take a break from the parenting, and dad gets to swoop in and enjoy some one-on-one with bub. Using a baby carrier to take his new baby out for strolls is a great opportunity for dad to enjoy some quality interaction with baby. Having baby in the carrier keeps baby nice and close to dad’s chest, which offers security and warmth, as well as the chance to chat about what they can see in the street as they walk. Reading stories is something else that can be worked into a daily routine, and it’s a habit that can last a lifetime. Not only this, but research has revealed that dads that read to their children can positively affect their creative development, says Beth. “Dads tend to relate what they’re reading in the book to real life experiences,” says Beth, which has a great impact on imagination and language down the track. Babies love singing, which is known for its calming effects on babies and is a big reason why nursery rhymes go down so well with children of all ages. Regardless of the quality of dad’s voice, coming up with a special song that is just between the two of them is a lovely way to spend quality time together, and something that can become a regular ritual that’s just for them. Spending time soothing and settling baby to sleep can be a beautiful way to bond, and according to Beth, dads make great settlers. 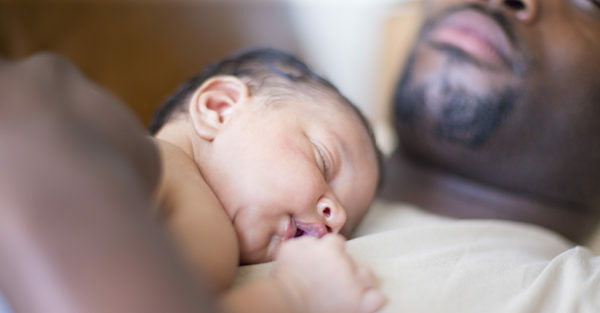 To make the most of this skill, dads can help out during the night by settling baby back to sleep after a feed, which means you can get back to snoozeville a lot quicker. It also allows dad and baby to spend some quality time together in the quiet of the night, which, despite its challenges, can be pretty special.